A hundred years ago Brisbane inadvertently was at the centre of world events. Tom Sergeev (aka Artum) arrived in 1911 as a refugee from persecution in Czarist Russia. Six years later he returned to his homeland to help plan the Bolshevik Revolution. The presence of radical Russian Bolsheviks in South Brisbane became increasingly untenable. 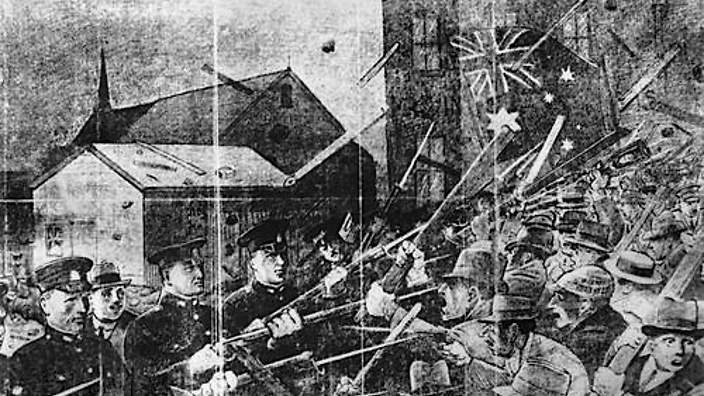 The Red Flag Riots in March 1919 where Empire Loyalists stormed the Russian precinct in Merivale Street highlighted these ideological tensions. Trained in Anthropology, Kay Saunders AM was professor of History and Senator of the University of Queensland from 2002-6 and CEO of The Brisbane Institute, 2006-9. She also worked at Bond University 2012-14. Serving on the Council of the Australian War Memorial (1994-7), she was Chairman of the Official History to the Australia at War Committee. Professor Saunders was appointed to the Council of the National Maritime Museum of Australia (1994-6) and was director of the National Australia Day Council (1992-7). She served as Chair of the Queensland government’s Cultural Advisory Council (1997-99) and was a member of the Premier’s Advisory Council on Women’s Policy (1999-2001). She is a Fellow of the Academy of the Social Sciences in Australia, the Royal Society for Arts, the Royal Historical Society (London) and the Royal Anthropological Institute. In 2001 she received the Medal of the National Museum of Australia and in 2006 was the recipient of the John Kerr Medal from the Royal Historical Society of Queensland and is a recipient of the Federation Medal. She is an entry in Who’s Who of Australia. Her most recent books include A Crowning Achievement: A Study of Australian Beauty, Business and Charitable Enterprise (2005), Between the Covers: Revealing the State Library of Queensland’s Collection (2006) and Queensland: 150 years of Achievement (2009), Notorious Australian Women (2011), Deadly Australian Women (2013) and Bond University: The First 25 Years (2014).